A Las Vegas senior says a solar salesman left her in the lurch without money-saving solar panels and dragged down her husband's credit score in the process. Sandy Marriott says in May she found a yellow piece of paper in her mailbox which promised no up front cost solar panels and a big discount on her energy bill. "I would love to have a lower electric bill -- I really would," said Marriott. "If solar is the way people are going and it's supposed to be cheaper," added Marriott. Sandy called the number on the flyer but after an in-home visit from a solar salesman, she realized the 'no up front cost' panels would come with fees and financing. "He took my husband's social security number and I was kind of leery and he didn't even have a business card!" said Marriott. Weeks later, Sandy says the salesman claimed he was unable to use her husband's social security number for a credit check. Sandy says her husband's credit score was nearly 700 at the time of the inquiry, according to one website she checked. Sandy says when she started to question the salesman, he vanished. "He kind of blew us off and we never heard from him again or saw him," said Marriott. 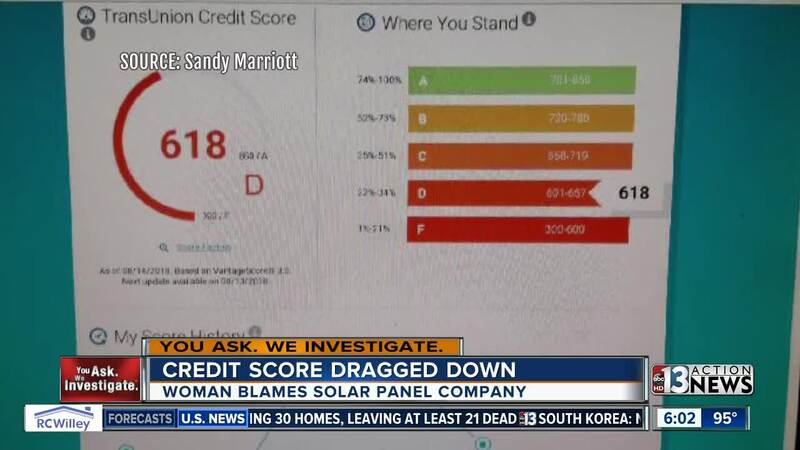 Sandy says when she checked her husband's credit again she was stunned to see it had plummeted dozens of points from 698 to 618. "I started to cry," said Marriott. "I said 'Oh my God! they are ruining us!'" added Marriiott. More search showed a mixture of hard and soft inquires and at least one of them included Vivint Solar. "There was another financial institution and they list the phone numbers, so I called the institutions and they said they running it for Vivint," said Marriott. 13 Action News emailed Vivint Solar and a spokesperson says Sandy's husband's credit pulled with the customer's written permission. Vivint Solar did one "hard credit pull" on Marriott's credit on May 30, and an additional hard pull done by LoanPal, a lending institution in June. Vivint Solar also did a pre-screen, also known as a soft pull, on both Mr. and Mrs. Marriott's credit. A Vivint Solar spokesperson said there could be multiple factors for the impacted FICO score and it was definitely not the result of a single hard pull by Vivint Solar and a single hard pull by LoanPal. In the spirit of goodwill, Vivint Solar has sent a letter to all three credit bureaus asking for the hard credit pull to be removed from the credit reports. A Vivint spokesperson said they company will reach out to Marriott to explain her options moving forward.